Keeping a variety of healthy snacks and treats in the house is essential for any family, especially when you have children. In addition to fresh fruits and yogurt, pretzels, popcorn and cookies are among our household favorites. Newman’s Own Organics has a great selection of organic snacks to satisfy even the most finicky eater! My family recently received a box full of organic goodies from Newman's Own Organics and I must say that I was impressed! Not only was I surprised at the amount of healthy snacks they sent us, I was also surprised at their great variety and assortment of organic snacks and treats they offer. 'Organic' will be the last thing you think of when you try Newman’s Own Organics tasty Pretzels, Chocolate Bars, Cookies, Chocolate Cups, Pop's Corn, Dried Fruit, Mints and Licorice. They're just so good! My kids loved the pretzels and licorice. My husband's favorite were the chocolate chip cookies, and even though I liked them all, I'm going to have to give my vote to the hint o' mint cream filled cookies! The pretzels were crunchy and flavorful. Not too salty, they had the perfect amount! Both of my kids had them for their morning snacks at school for an entire week. They enjoyed them plain as well as with peanut butter for dipping! The licorice was soft and sweet. The flavors were bold, unique and mouth-watering! I was a little worried about the sour licorice being to bitter, but it was the perfect combination of sweet and sour! Cookies have always been one of my favorite desserts, especially those that you can take apart. I love cream filled cookies because you can twist them apart and enjoy the cookie and cream separately - or together! You simply can't go wrong with cookies.... am I right? Chocolate chip cookies and minty cream filled cookies make for a sweet treat and the perfect dessert. Whether you like your cookies alone or dunked - you're going to love them! 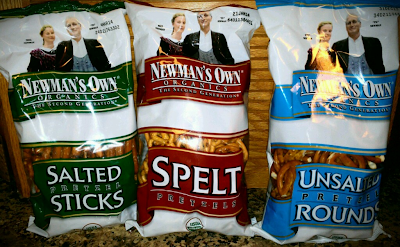 “When Nell Newman and business partner Peter Meehan started Newman’s Own® Organics: The Second Generation® in 1993, they were sure there was a market for organic snack foods, but they couldn’t have anticipated just how fast the demand for their products would grow.They started with pretzels and grew to include other snack foods and has now expanded to many other organic items: coffee, tea, olive oil, balsamic vinegar, organic dried fruit, and pet food. 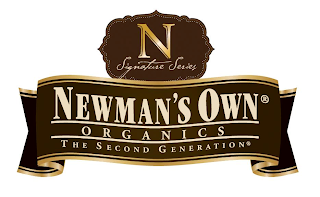 Newman's Own Organics was established as a division of Newman's Own in 1993, and became a separate company in late 2001. The sale of Newman's Own Organics products generates money for the Newman's Own Foundation to give away. Since 1982 Paul Newman and the Newman's Own Foundation have donated more than $350 million dollars to educational and charitable organizations worldwide." This giveaway will end December 1st at Midnight EST. 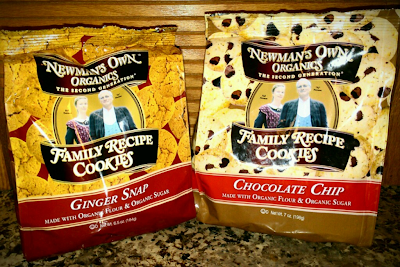 Disclaimer: The Being Frugal and Making it Work family received complimentary Newman’s Own Organics snacks for the purpose of writing a review and hosting a giveaway. Regardless, I only recommend products or services I would use personally and/or believe will be a good fit for my readers. The views and opinions expressed on this blog are based purely by our own experiences. No monetary compensation was received. Results may vary. would like to try the Fig Newmans. Like Fig Newtons and would love to try these. I would like to try the Newman's Own Organic chocolate cups. I would like to try the peanut butter cups and the caramel cups. I would like to try the Newman's Own Honey Wheat Mini Salted Thins. Thank you for the review and giveaway! I'd like to try the Dark chocolate with orange. 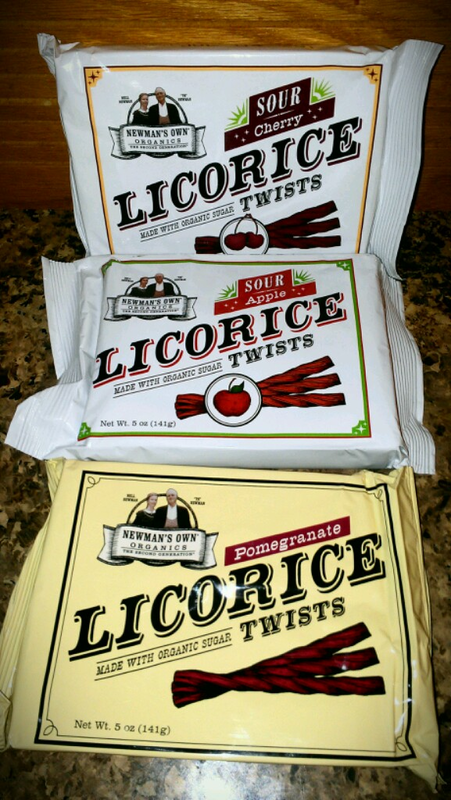 I want to try any of the sour licorice flavors. It's so hard to find organic candy! The Spelt Pretzels sound like both a tasty and healthy snack to enjoy anytime and a much better alternative to potato chips! We love Newman's Own products. I would like to try Newman's Pop's-Corn organic popcorn. I would like to try Newman’s Special Blend organic coffee and any of the cookies or candies. I'd love to try Newman's Organic Peppermint Cups and Peanut Butter Cups! I think they'd be a big hit for the whole family. I would love to try their organic dried plums as I love dried fruit for the healthy antioxidants and fiber benefits! I would like to try Newman's Own Organics® Apricots, Prunes, and Cranberry dried fruit line. I would love to try the VANILLA Alphabet Cookies and my little ones can pack these for snack in school. They look delicious. I would most like to try the licorice twists. The sour apple and black licorice flavors sound delicious. One of my favorite treats is dark chocolate flavored with orange so I would like to try that from Newman's own. I love the ginger-O's. They are delicious. I know that I have not tried the peanut butter cups yet, but they sound good. Thanks! Fig Newmans are my favorite. I would like to also try the Newman's Pop's-Corn organic popcorn. I would love to try the peanut butter Newman O's. And I would also like to try the dried apples. Thanks. I would love to try the Extra Dark Chocolate Cups with Peanut Butter Centers. I would also like to try their pretzels. I have tried the coffee and their pizzas, and both were awesome. I'm already a big fan of Newman's dark chocolate peanut butter cups...I would really like to try the dark chocolate peppermint cups. I bet they are just as delicious! I would like to try Honey Wheat Mini Salted Thin. I already buy their special blend organic coffee. I have yet to... but really want to try their organic dark chocolate. I bet the fig newmans are really good! I would like to try the popcorn. I love pretty much any type of popcorn so I'm sure I'd love theirs. Would love to try the dried fruit. Apricots and a Berry Blended in particular and I'm sure my kids would like them too! I have never tried Fig New,and but have always wanted to do. Hmm...I need to find some! I do like the Pop's Corn! I most want to try their hint o mint cookies....I haven't been able to find them yet in my local markets. I'd love to try the Newman O's, they sound delicious. Thank you so much for hosting! I'd like to try the Ginger O's! Something very different, and I love the taste of ginger, I bet they're sooo good. Since I am a huge chocolate fan, I would love to try the Newman's Own Organic Milk Chocolate bar. I would like to try the Berry Blend Dried Fruit. 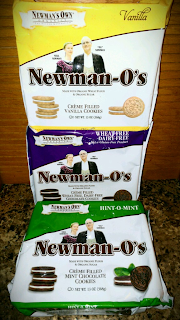 I am most interested in the minty cream filled cookies from Newman's Own Organic snacks. I want to try the Cinnamon Hermit cookies. They sound delicious and I like that they are a classic style taste. Their great selection made it hard to choose but I would love to try the berry blend dried fruit! The Newman's Own Organic chocolate cups sound delicious! I know I would love to try them. I am going to say the Fig Newans because my last name is Newton and I always get jokes 'Fig Newton' jokes. I love Newmans Own, so this is exciting. Thanks for the opportunity to win. I would love to try the Fig Newmans, either the low fat or the fat free would be great, thanks! I have tried almost all of their products! They are yummy! I love the mocha chocolate bars, the peanut butter cups. I Would love to try the flavors of licorice sticks! I would like to try the Original Hermits. They remind me of a cookie that my grandmother used to make. I would like to try the Pop's Corn. I'd like to try the Mocha Milk Chocolate. Thanks! Would love to try Fig Newmans - have heard they are awesome!